Sigfried Trent recently wrapped up his hugely popular Advanced Feats series with Advanced Feats: The Inquisitor’s Edge. 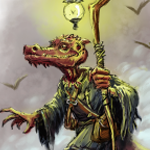 Perhaps a little too caught up in the general excitement, several kobolds put on black cloaks and wide-brimmed hats and confronted game bloggers with the book, demanding that they confess their true thoughts about it. Each feat adds something extra to the class, the walk through lends its self to solid ideas and aids on understanding the class, and then the builds exemplifies them. Read the full review at Emerson’s Bookshelf. One of the reasons that made me a fan of Advanced Feats, is the author’s design philosophy: constantly pushing the feat mechanic into new and refreshing directions. Read the full review at Tower of the Lonely GM. 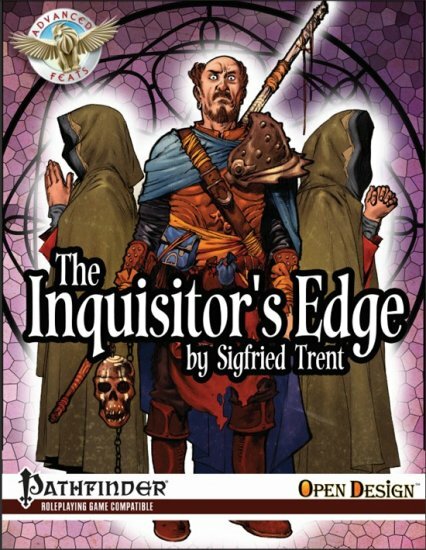 Trent documents many of the inquisitor’s strengths and tactics early in the book. That section alone should probably be used as an overview of how to use an inquisitor’s abilities in a campaign. Read the full review at Game Knight Reviews. The 30 feats in this book have utility outside of the class and emphasise the inquisitor’s unspoken strength as a team player. The builds display how good and evil characters alike can shine. Read the full review at Fame and Fortune. To readers, if I sound a little fan-boyish, I admit it. I love my crunch for my Pathfinder RPG and this is some great stuff. I heartily recommend it! The Inquisitor’s Edge is available at the Kobold Store for the use of the biggest, baddest, and boldest PCs. Is there any chance that Mr. Sigfried will be compiling these into a hardback book?